About a year ago, the government of Karnataka approved a steel flyover road that would run from Basaveshwara Circle till the Kempapura junction after the Hebbal interchange, to ease the traffic congestion leading to the Kempegowda International Airport (KIA) which was estimated to cost a whopping Rs 2,100 crore. Little did they know this project would become a lynchpin that would energise citizen activism like never before. Thousands of people came out on an early Sunday morning to form a human chain and tell their government that it was a terrible idea. 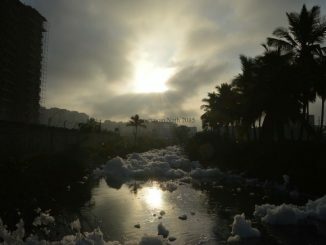 The offset of a collective awareness that Bengalureans were on their own in seeking even basic amenities, the horrendous lack of garbage disposal, mobility and the opaqueness with which the government undertakes major public projects brought people together that morning. But what was so different about this protest? Citizen activism isn’t a new in Bengaluru and people have been working on city issues for very many years. 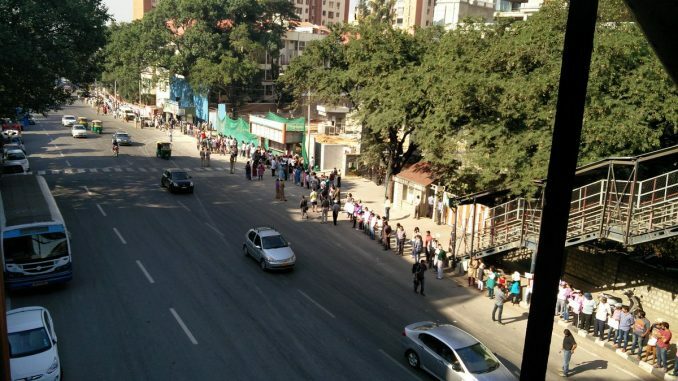 To start with, it was the sheer number of people who stretched from Chalukya Circle to Mekhri Circle. Nobody had expected that kind of turnout. The simmering anger against the political apathy against our city at large had finally spilt over. However there was another important development. For a generation that is familiar with the idea of instant gratification as opposed to dogged determination required for the long run, the campaign saw the birth of Citizens for Bengaluru—a completely volunteer-run organisation that has managed to not only sustain itself for a year, but also run successful campaigns on various issues that plague Bengaluru. The power of a citizen’s collective was reintroduced into the public psyche very effectively. “During my first year as a student of architecture, a few city activists tried to stop the National Games Village that was coming up at Koramangala adjoining the lake bed. That was my first memory,” remembers Mala Sugantha who came on board with CfB after the Steel flyover. What riled the public sentiment even more was that in spite of the huge turnout at the human chain the Chief Minister Siddaramaiah and Minister-in-charge for Bengaluru K J George were determined to go ahead with the project and made statements to this effect at many public gatherings to the media. So when CfB, which born after the human chain, called for weekly meetings to discuss the way forward, enthusiastic volunteers turned up from as far as Peenya, Rajarajeshwari Nagar, Hebbal etc (even on a working day). The citizens refused to back down as had been the norm from previous times where the government chose to roughshod over public sentiment. The citizens also understood that to get our politicians to understand we were serious, we had to speak to them in language they understood well – numbers. Enthused volunteers spread across the city for the Beda Ballot box, which collected almost 43,000 votes against the project on paper. They were tabulated at the conference at Rotary Club which saw the best of urban planning minds come together and explain to the government on why this was such a bad idea. The pressure was building. A fortnight later, a day-long hunger fast was held at Freedom Park bringing together the common citizens and eminent Bengalureans. The government which was getting antsy by then had even deployed extra security with CRPF guarding the venue. The message was getting out loud and clear that this dissent was not a flash in the pan and that the citizens were serious about getting the government to listen to them. CfB then organised a painting competition for children, Namagagi Ulisi, asking them to reimagine Bengaluru for their future mentored by S G Vasudev. As all of these programs were happening, a group of volunteers began to map the 1,000 trees which were expected to be felled for it, because data was paramount to make accurate arguments. But the real challenge for CfB came after the steel flyover was finally cancelled by the government owing to the public pressure. The National Green Tribunal gave an adverse verdict owing to the fact, that the necessary permissions were not in place, in response to a petition filed by another citizens’ group. It hit the final nail in the coffin. It was a jubilant time for all those who had been part of the protest. For many of us, the unthinkable had happened. We had made the government listen to us! But nobody had thought of what would become of us beyond this project. The project was the trigger that brought the city together, so many of us believed, it would end with it. But success of the campaign made citizens realize that they had a say in governance that did not start and end on election day. Participatory democracy was a constant process and it wasn’t just about one project. During the Steel Flyover Beda campaign, some obvious truths which were hidden in plain sight became evident. Infrastructure projects, especially the large ones designed for urban mobility, presented perfect opportunities for political parties to line their personal coffers (which made a vigilant citizenry extremely important). And the need for projects/solutions that helped ease the infamous traffic jams of our city were very necessary. We just needed a holistic and scientific approach to problem of urban mobility. 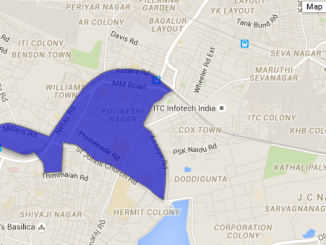 Data was being sourced as we started to engage with other players who had been working in the area of Urban Mobility. The discussions and debates gave us our urban mobility campaigns “Bus Bhagya Beku” and “Chukubuku beku”. The demand for suburban rail and and better bus services, to get people to switch to public transport caught the imagination of people. Perhaps it did not have the emotive quality of the steel flyover beda campaign, but given the response both the events, it was well-received. The government too listened to the arguments being made which had merit. New MEMU trains were introduced; 3000 buses were added to the fleet and our campaign names became part of the ministers’ lexicon too who used them liberally in their speeches. 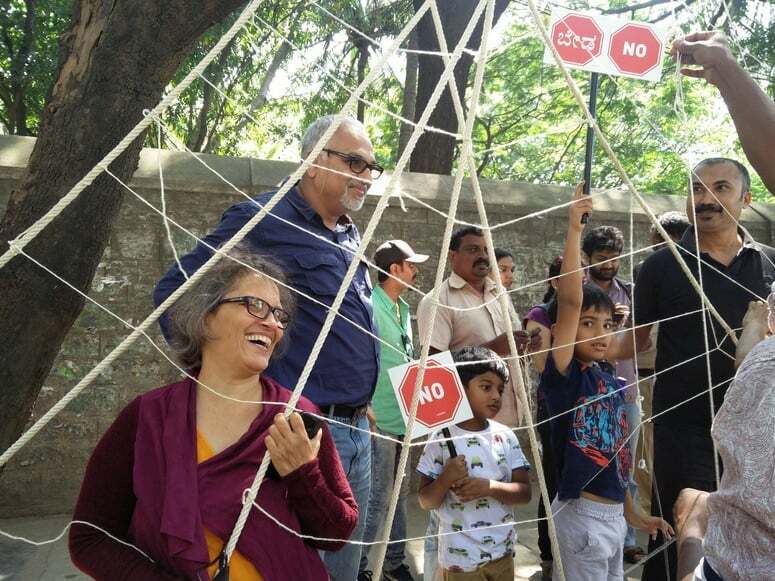 Every time there was a project that had more pros than cons and had no scientific basis, we got together to get the government to rethink it at least—The Jayamahal road widening project saw more than a 1000 people turn up for a second session of the human chain as did the recent protest against the Shivananda Circle flyover. CfB also decided to get involve with the ward committee selection process because we understood that to solve a problem, we need to be part of the process that addresses it. We worked on simplifying the process of applying to them and hundreds of enthusiastic people turned up at the BBMP headquarters in pouring rains to apply for them. It is said that the most brutal dictatorship (or as in this case, an indifferent and arrogant government) give rise to the most powerful dissents. The success of CfB gave a shot in the arm to others to take up a fight against the stacked system. One such success was the saving of four century old trees at the government Veterinary Hospital at Queens Road with a green canopy of more than 2 acres in the heart of the city which was already choked because of traffic. The idea of CfB was born as a result of citizen anger and government apathy and channeled it to great strengths. But, more importantly, what it has allowed is for the people to believe in their right to question their government and also get them to listen. Citizen participation is no longer an aberration but now a norm. Note: Prabha Dev and Mala Sugantha contributed to this article, while Manasi Paresh Kumar compiled it. A small team has quietly pushed for a study to understand the issues of Bellandur and Varthur lakes, with the support of experts and army men. There is hope again that the lakes may soon see better days.